• Vibrates when the signal is received. • To switch on the vibrating pad, set the ON/OFF switch on the side panel to ON position. 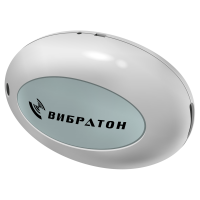 • When the alarm on the clock is actuated, the vibrating pad starts vibrating. To reset the alarm, press the RESET button. 1. Unpack the wireless vibrating pad. 4. Set the ID code corresponding to the base unit using microswitches. The default setting: all microswitches are in ON position. 5. Insert three batteries (size LR03) ensuring the correct polarity. 6. Close the rear cover. 8. Set the switch to ON position. 9. Check the device operation, having set the alarm time on the base unit. 10. Use the RESET button to stop the signal from the base unit.